And the grrl scout cookie party continues. I wish that this whole idea didn’t probably violate a million intellectual property laws, because I really think that this could take off as a business. I’m also having a great time employing my friends to re-name cookies and brainstorm ideas. All of the clever cookie names can be attributed to my friend Carolyn. Check out her blog here. Today we are talking about Do-si-does. Do-si-does are oatmeal sandwich cookies with a peanut-butter filling. 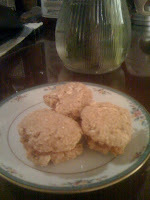 I love oatmeal cookies, and I had a great recipe using bananas and plenty of steel-cut oats. I like this particular recipe because wet and dry ingredients get mixed in the same bowl. This means less dishes, and for someone who does not have a dishwasher, that is a very, very big deal. A disclaimer: I totally screwed up this recipe when I made it. I added an extra half a cup of oats to the batter because I thought it was too wet. As a result, my cookies were a little dry. I combated this by dipping them in soymilk, which was a good solution. However, I am going to save all of you the trouble and let you know how to make them the right way. These cookies can be used for my do-si-don’ts, or you could serve them all by themselves. If I were just using the oatmeal cookie recipe, I would probably have added some raisins into the batter. I love raisins. Cream banana and sugar. Add egg replacer and beat thoroughly. Add vanilla, cinnamon, salt, baking powder, flour, and oats, beating well after each. Drop by golfball-sized scoops onto a greased baking sheet, about 2″ apart. If making the sandwich cookies, flatten them just a little. Heat the peanut butter and soy milk, either on the stove or in the microwave. Spread a thin layer in between two cookies.